"This is what you give me to work with? Well honey, I've seen worse." So goes the opening line to Disney's 1998 film Mulan, which over the course of its opening song deconstructed the idea of what their franchise's "Disney Princess" could be. Through a sense of irony, a discomforted tomboy named Mulan prepares for a meeting to be judged on her looks and skills. There is no care for what she actually thinks, just that she follows tradition and bring "Honor to Us All." Over the next 20 years, Disney has done plenty to create female characters that are strong, independent, and break gender stereotypes in ways that have regenerated the studio's relevance. However, it was with Mulan that they created something special, something that not only showed that a woman could do a man's job, but that gender tropes go both ways. It's important to see your own reflection, your true identity, staring straight back at you. Disney may have harped on this matter several times, but rarely with the clarity and perfection as that of their fiercest, most exciting movie that they've ever released. So much of the film could've relied on outdated "tough girl" tropes, of the woman who acts like a man to achieve their approval. This isn't to say that Mulan doesn't try to be perceived as one when acting as Ping after joining the army, but it's more of a broad comic approach meant to show even more division between her character and the Chinese male population. She isn't allowed to be in the army, because of men. She has to marry a man, even if she doesn't want to, in order to honor her family. She has to appease her father by joining the army in his place following his debilitating health. So much of the film is reliant on Mulan trying to navigate a male-dominated world full of people spitting, running around naked, and having the fantasies of a primitive version of a housewife who does nothing but cook. The film paints all of this as her own form of vulnerability, her inherent disconnect from a society that she could be useful to but doesn't have that natural instinct. As animal sidekick Mushu would say, "You're the man... well, sort of." The film is sparse on Disney Princess tropes to the point that it seems wrong to consider her in that camp. She has too much of an independence and drive, finding ways to defeat the Huns through strategic canon firing that places an entire army inside an avalanche. She is an incredible character in that she doesn't use her disconnect to retreat and wait for a knight in shining arm. She is the knight in shining armor, and her struggle is real. Throughout the iconic montage set to "I'll Make a Man Out of You," there is a clear struggle to survive. She falls from weakness, gets bullied by her peers, and in the process learns to grow from it. This isn't an example of women being weak, even as the song implies a masculine mentality, but that overcoming struggles is its own triumph. The ability to hold one's own in a community that works together sends a great message. Adding in Mulan's struggle to hide her femininity also allows the song to have an irony when she side kicks Captain Li Shang in the face during training. He did in fact "make a man" out of her. The film's gender politics get interesting when viewed from her perspective. In the film's heartbreaking song "My Reflection," she contemplates a life of being happy with herself while also pleasing her family. She can't because she's too much of a tomboy, a goof-off for what tradition dictates. It's the insecurity of being herself, which continues to shine through as she joins the army and must hide behind tadpole reefs while bathing. It isn't until later that the masculine ideal is turned on its head when Mulan defeats the Huns by sending her male colleagues in drag into the Emperor's castle, with "I'll Make a Man Out of You" reprising itself with once again an ironic intention. It's a moment that suggests that the divide between masculine and feminine social norms are ridiculous and that both share a similar usefulness. Mulan is somewhere in between them, and it's only in her defeat of the Huns that she fully realizes her potential and gets the respect she deserves. It's quite a revolutionary concept for a Disney film, especially given the transphobic comedy of mainstream 90's comedy around the time. The film is a breathtaking achievement that Disney hasn't quite reached ever again. Mulan came towards the end of the 90's Disney Renaissance, and left the unfortunate need for films with more compelling characters. It wasn't a great film because a woman was fighting in a war, but more that Mulan found her identity through natural means. There was an insecurity in her character, even at her most confident, that left an indelible mark on cinema. It's because of her ability to be such an empowering figure in spite of her self-doubt that lead her to become a legitimate Disney Princess, soon appearing in both Wreck-It Ralph 2: Ralph Breaks the Internet, and with her own live action remake set for next year. She is a character who far exceeded the bars set by Cinderella and Sleeping Beauty and presented a new type of princess who was more than fan service. It also helps that the music is some of Disney's most subversive and exciting. The structure isn't similar to even early 90's movies from the studio like Aladdin or Beauty and the Beast. Instead, it was driven largely through central themes mixed with quirky comedy, Broadway melodies, and Chinese instrumentation. It was an eclectic style that conveyed an anachronistic portrayal of China, but also created a world where music could be subversive. "A Girl Worth Fighting For" is a tune that could've been taken from any 1940's World War II musical, but instead is used to convey the altering mindset between the male characters and Mulan, who both have different visions of life back at home. One wants to be masculine heroes who show off battle scars, while the other wants intellect and is ridiculed for it. It's the struggle that the film explores in invigorating ways, and manages to make a timeless struggle into something of power. The film may be lacking for all-out musical energy, but it still gives effort where it counts, most notably in "My Reflection" when the powering brevity captures an internal struggle that's more general. Most of all, it's a film that validates the struggle of a child. 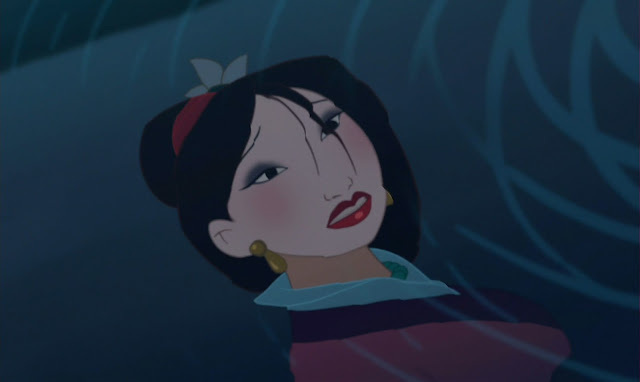 Mulan spends the film trying to receive honor from her family, most notably her father. There is a rift between the two throughout the film, and it's apparent that his involvement in the war would leave him dead. Without a son to take his place, he is the rightful heir, and Mulan's concern makes her a noble figure. Still, it's through the humiliation and disregard from her peers throughout the film that makes her struggle feel triumphant. Even then, it's the final moments of the film where her father says "The greatest gift and honor is having someone like you for a daughter." Without this intimate relationship cue, the film wouldn't have nearly as strong of an impact. For all of the struggles, it's this hug that captures a sense of pride, something that is often reduced in other Disney movies for male love interests. While Shang may qualify as a love interest (especially if following Mulan II), Mulan is a revolutionary Disney character because the film isn't about love of courtship, but that of family. Mulan is a film that didn't get nearly as much love during its release as most Disney movies of its time. It only received one Oscar nomination and came at the tail end of the Renaissance period, right as the films were becoming more divisive. Even then, the film deserves to be held alongside the very best of the studio's output. It was a film that presented a protagonist who had a rich internal struggle and went through challenges that weren't only cinematic, but captured the struggle of identity perfectly. While the film may have some dated elements, such as Jerry Goldsmith's sometimes flamboyant score, it definitely lived up to the standards of Disney and created one of their best and sometimes most underappreciated characters. She brought honor to her family not by being the most beautiful, but by standing out in her own way and making a difference that impacted everyone else's life. It wasn't just a film that was great because of its quest for honor, but its quest for acceptance of a loving family as well.